with the trains in revolt, man in uniform shooting himself in a toilet cubicle and a racist community leader on national TV; it is such a depressing way to end the year. It is expected, with the population hitting 5 million mark, its definitely turning topsy turvy. The only way to cure these negativities is to fill them in with festivities. Find an escape to usher in the new year. FInd new resolutions and be merry! It’s been a while since we have played live. A nice comeback gig for the year’s end organized by The Bloco Singapura Family. We have been invited to play alongside The Bushmen, Novo Bloco, Rhythm De Passion and The Dub Skankin’ High on New Years eve. Well, how nice is that? The last time we played with Bushmen was way back in 1999, and it was on a Saturday Afternoon at Youth Park. A gig where we we played for each other. Last week we were invited to be part of Najip Ali’s new TV series called ‘Kita Gerek’. We had loads of fun being thrown into the spot like a chihuahua doing a lap dance. I think it will be shown next year on Suria. We covered M Nasir’s (Kembara) “Duit”, a straight Scorpionesque riffy song about money. 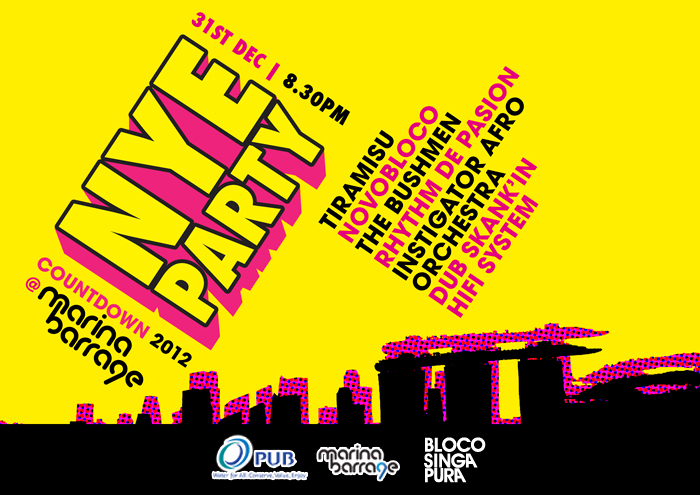 NYE Countdown Party @ Marina Barrage is organised by Marina Barrage, a project by PUB – Singapore’s national water agency. Come and join us at our 4-hour non-stop New Year Eve’s Countdown Party @ Marina Barrage from 8:30pm onwards. This celebration will feature popular local bands like Novo Bloco, Bushmen, Tiramisu and more. Groove with them and enjoy their stunting performance. Besides the concert, there will be a fun carnival featuring pockets of novelty acts, food and beverages, workshops, flea-market and fun inflatable. The grand finale of the night will end on a high note with fabulous fireworks set against city skyline. Locations like the Green Roof, Marina Bridge and Central Courtyard in the Marina Barrage are some of the best sites to see this spectacular display of lights and fire. ~ by tiramisu on December 23, 2011.